Wilderness trail in the Kgalagadi National Park. 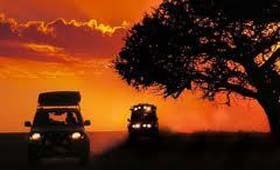 Sunset Desert tour, Morning tour to experience bushmen culture. Visit to Hakskeen Pan to see the site for the "Bloodhound" World Land Speed record attempt. DAY 1 Departure from Upington airport is at 11h00. Your vehicle is a double cab 4x4 with air-con and GPS. Detailed maps, driving instructions and GPS co-ordinates will be supplied to you. 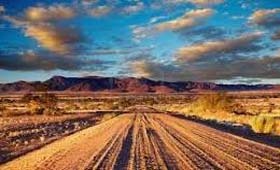 Driving the northern road (R 360) toward Kgalagadi you will travel 200km today. There will be an opportunity to stop for lunch. Continue on to your overnight stop at a Kalahari bush lodge situated close to the Kgalagadi Park. The day is ended with a guided sunset 4x4 excursion. Treat yourself to awe-inspiring scenes, as you take a drive to ancient Kalahari salt flats and enjoy some refreshing sundowners on the edge of one of these majestic plains. Experience the roaring silence in this vast stretch of nature. Enjoy dinner at the restaurant. Accommodation is in an air-conditioned chalet. DAY 2 Up early for the Springbok Breakfast Run. Enjoy a real farm house breakfast with the first morning sunrise while marveling at the surroundings that is so unique to the Kalahari. 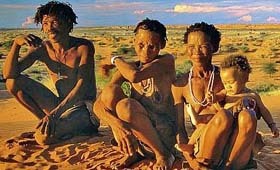 You will then visit three San Bushman heritage sites, Bushmen caves, sand dunes and vulture nests. You will be entranced by local bushmen tales as your Khomani San guide shares his heritage with you. After lunch you will drive to Hakskeen Pan. This is the venue for the next World Land Speed record attempt by the " Bloodhound " During the months of Dec - Feb 2014 it will be a hive of activity as the Bloodhound team make preparations to break the 1 000 mph mark. In the late afternoon continue on to the Kgalagadi National park and check into your chalet at the rest camp. Chalets are air conditioned and have kitchen facilities, shop, fuel, restaurant, information centre, swimming pool, 24 hrs electricity and cell phone reception. DAY 3 Today you will enjoy a full day trail in the park. An amalgamation of the in South Africa and the Gemsbok National Park in Botswana, the Kgalagadi Transfrontier Park comprises an area of over 3,6 million hectares � one of very few conservation areas of this magnitude left in the world. Red sand dunes, sparse vegetation and the dry riverbeds of the Nossob and Auob will reveal antelope and predator species providing you with some excellent photographic opportunities. Your route will take you along the Auob River bed to Mata Mata where you can stop for lunch and let the midday heat pass. (Take your own picnic lunch or use the camp shop.) Your return journey will also take you along the Nossab River Bed. 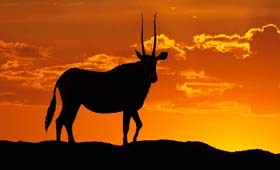 Keep a look out for: Gemsbok, these large striking desert antelope are the emblem of the park. Suricate (Meerkat), these hyperactive little omnivores have a wonderfully intricate family structure. Black-mane Kalahari Lions. 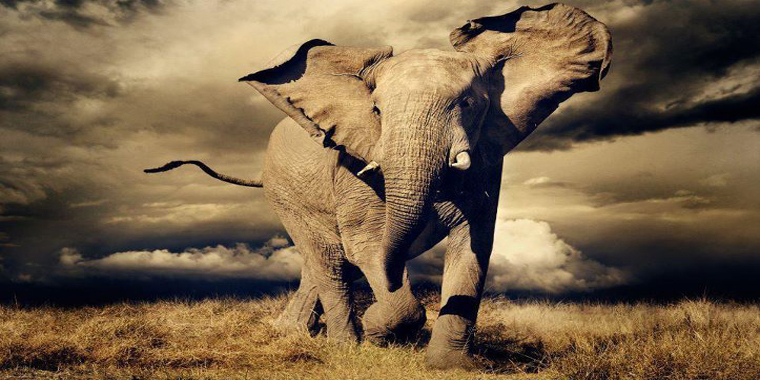 Physically impressive, they are the kings of the Kalahari Desert. Pygmy falcons, the park is famous for its birds of prey. This is the smallest falcon in Africa and is often seen around Sociable Weaver colonies preying on the birds. DAY 4 As per day three. Today you will drive a partially different trail. Bring your picnic lunch with you as there are no facilities on this route. DAY 5 After Breakfast enjoy a short game drive or return to Hakskeen Pan to see how the "Bloodhound" project is progressing. After your picnic lunch you return to Upington. Your lodge is an oasis in the desert, situated on the banks of the Orange River. Enjoy a sundowner under the trees and watch the river waters glide by as you recall the adventures of the past few days. DAY 6 After breakfast you return to Upington Airport for your 11h00 departure. Arriving in Johannesburg there are a number of interesting options while waiting for your onward flight. One of these options is to drive in a world class single seater racing car. Drive as fast as your nerves will let you.